Yesterday, my comic-book shop left a message for me. 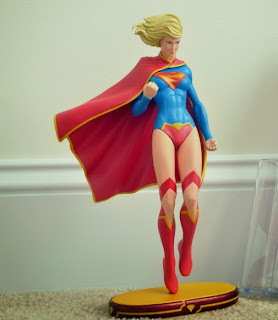 The brand new Supergirl statue from the DC New 52 Covergirls series had come in, and they wanted to know if I was still interested, and if they should put it aside for me. As anyone who has read this blog could predict, I told them of course! I hadn't planned to head over to the comic shop today, actually. Even though it is New Comic-book Night, only one book on my pull list was due out this week (Lazarus #4), and I figured it would cost me more in gas to drive there and back (now that I live 40 minutes from the shop) than the cover price of $2.99. Since I had more issues due out next week, I figured to just wait and pick up Lazarus a week late. However, knowing that the statue was there, I decided it was worth the trip. This statue was announced about 5 months ago, and I've been dying to get it ever since. It's only the second statue ever made of Supergirl in her "New 52" costume. And although that's not exactly my favorite version of her costume, given the display I am planning to make, with one shelf devoted to each of Supergirl's four major incarnations, I figured this would spruce up shelf #4 (the current one). That's not to say I have all the figures I need yet. So far, I only have one action figure for original Kara (the "Crisis" uniform, as people call it, with the head band and the red shoulder stripes), and one for Matrix Supergirl (it's not explicitly called that, but it is the proper costume for Peter David's version). I don't have any yet for the second Kara (the one with the bare midriff) -- that is my next assignment. However, the other thing I like about this statue is that it's a full-sized one, not just a bust or waist-up figure. And so, I headed out to the shop today, and picked up the statue. Sure, it set me back to the tune of a good 5 or 6 trade paperbacks, but again, this is something I really want to have going forward for my future display. Of course, as soon as I got home, I took it out of the box and assembled it (easy enough to do -- just insert the prong coming off her right boot into the base). This statue has many good points, and is very well made, although there are some small flaws. First of all, unlike the Matrix Supergirl who also is posed as if flying and only connects to the base via one foot, this statue is quite sturdy despite the single point of contact. It's no more wobbly than the Batgirl statue, which has two feet solidly on the ground (and two insertion points onto the stand). In contrast, Matrix Supergirl wobbles a lot. So I like the solidity of the statue. The flowing cape is probably my favorite feature of this statue. It looks really good, draping over Kara's shoulders and down behind her as if it were made of real cloth. I almost feel like I can see it moving when I look at the statue. Additionally, I like the position on this figure. It is clearly meant to mimic Kara's position on the cover of issue #1, including the way the cape and hair flow, and the way she holds her legs slightly flexed, although the right arm balled into a fist is not quite the same. The position is good, and she definitely looks like she's hovering above the stand, clenching her fist after having just socked a villain the jaw. Finally, the overall detail of the costume is very good, with the various clothing elements such as the S-shield, knee cut-outs for the boots, and the like, all sculpted quite well. Finally, the face on this statue is good. It has always been my view that, like her cousin Kal-El who is supposed to be a handsome, heart-throb of a man (think of Christopher Reeve), Kara Zor-El should be one of the most beautiful characters in the DC universe. The statue's face is sufficiently pretty to do the Maid of Might justice, although I still think the face on the Matrix Supergirl statue is better-looking. On the other hand, there are two technical errors on this statue. First, on Kara's boots, the v-shaped stripes below the knee are not supposed to be yellow. As is clearly shown in the cover and within each issue, the whole boot is completely red. Second, the color of her top is the wrong shade of blue. The statue's top is a standard sky blue, but Supergirl and Superman have a darker, slightly aqua hue to their body suits. The difference is quite striking when I put this statue next to any of my other Supergirls (Matrix, Original, or New 52 bust) in daylight. 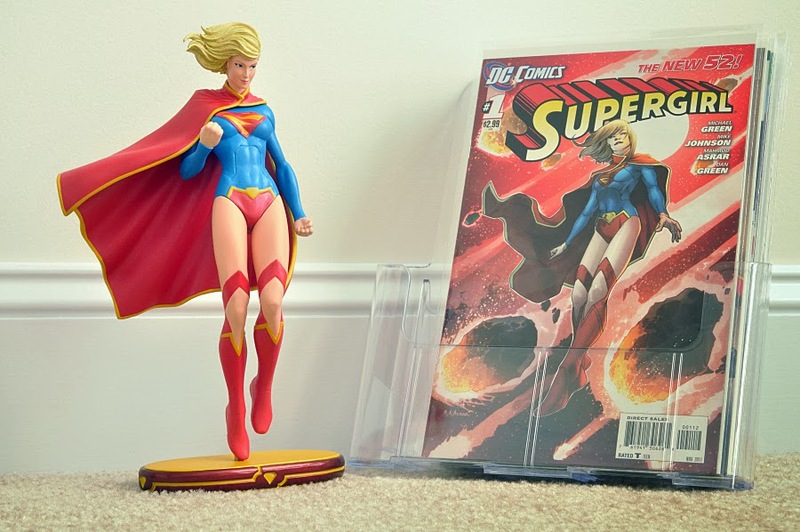 Overall, this is a very good statue, and well worth the $100 price tag, if you are a collector of comic-book statues, or of Supergirl memorabilia. The statue really does look like the New 52 character come right off the page, and she will definitely fit well in any collection of quality superhero figurines. I give full marks to the overall look of the statue and its sturdiness, but I had to deduct a point for the inaccurate coloring and boot stripes. The statue is based on this illustration http://artgerm.deviantart.com/art/DC-Comics-Cover-Girls-Super-Girl-364596372 not on the cover of the first comic issue (gladly), thus the yellow stripes on her boots. You should have taken more pictures and from a closer distance, nevertheless it's a nice review. I've ordered this figure too, plus this one http://www.amiami.com/top/detail/detail?gcode=FIG-KAI-5905 that I think is a better rendition of her. As for the picture on which the statue is based... if the picture has yellow boot stripes, then the picture is wrong. I mean, it's nice art, but that doesn't change the fact that in the comic, the boots do not have that stripe. This is supposed to be "the New 52 Supergirl." It should look exactly like the New 52 Supergirl, if they're going to call it that. It's not a huge deal, but it is a technical mistake, if not by the statue makers, then by the artist. That other statue, btw, is gorgeous. I probably won't try to pre-order it or even get it from Japan, but if it makes its way States-side, I will see if I can get my hands on it. Do a google image search for "supergirl kotobukiya" and you'll find some other renditions of her by the same maker that you may like too.